Chandra Asri Petrochemical Center was established by former President Soeharto’s second son Bambang Trihatmodjo’s Bimantara Group, Prayogo Pangestu of the Barito Group, Henry Pribadi of the Napan Group and Sudwikatmono, a cousin of former President Soeharto. 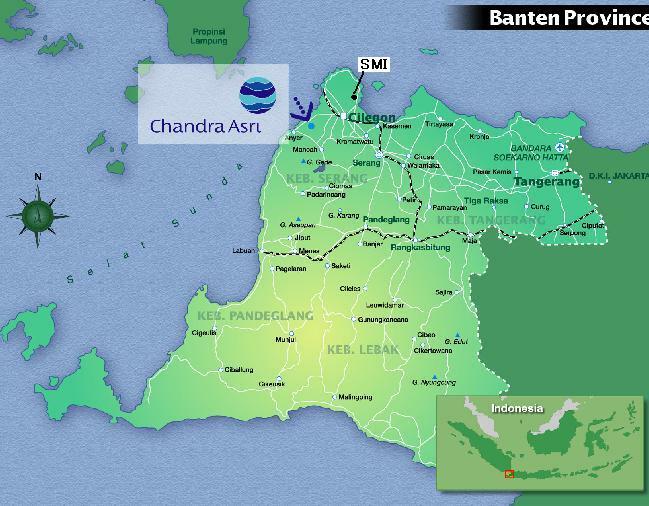 Chandra is constructing the extension of ethylene pipeline from Cilegon to Bojonegara to serve PT SMI. KBR’s proprietary SCORETM (Selective Cracking Optimum REcovery) ethylene technology has been selected by PT Chandra Asri Petrochemical in West Java, Indonesia, for an ethylene furnace expansion. KBR has signed agreements to provide the technology license and begin design work on the furnace design. KBR is the engineering and construction subsidiary of Halliburton. Barito Pacific to acquire 70% of Chandra Asri. Timber company PT Barito Pacific said it hopes to chalk up Rp 1 trillion (US$ 111 million) in net profit this year including from petrochemical company PT Chandra Asri it was to take over on Dec. 14. Barito will to acquire 70% of Chandra Asri for which it is to launch right issue hoping to raise Rp 9.16 trillion in fresh fund to be used entirely to finance the acquisition. Indonesia's market regulator has given its approval for a planned $1 billion rights issue 増資 by timber company PT Barito Pacific Tbk, which would be the fourth biggest rights issue in the country's history. Shares in Barito Pacific slid more than 10 percent last week after Bapepam said it would take more time to review the rights issue, aimed at financing the acquisition of a petrochemical company PT Chandra Asri. Fuad Rahmany, the chairman of the country's capital market watchdog, told Reuters in a mobile phone text message the agency had sent a clearance letter on Wednesday, which allows the firm to seek shareholder approval for the plan. Barito Pacific, founded by Indonesian businessman Prajogo Pangestu and now 21 percent owned by Commerzbank (SEA) Ltd, said in a prospectus in late September that 87.95 percent of the proceeds from the rights issue would be used to help acquire a 70 percent stake in Chandra Asri. Barito said the stake in Chandra Asri was valued at $1.05 billion, adding that it would seek approval from its shareholders for the acquisition and rights issue plan. The company plans to acquire a 14.6 stake in Chandra Asri from PT Inter Petrindo Inti Citra, a company 99.6 percent owned by Pangestu, for $219 million, and will buy a 55.4 percent stake in Chandra Asri from two Malaysia-based companies, Strategic Investment Holdings and MIH. Barito had said that its Singapore-based affiliate, Magna Resources Corporation Pte Ltd, will buy any shares from the rights issue that are not taken up by shareholders. Barito Pacific, which mainly produces plywood products, has a total stock market value of about $1.29 billion. Its share price has jumped more than six times so far this year. Indonesia's largest petrochemical company PT Chandra Asri said it will spend US$120 million to build butadiene plant early next year. Chief Executive Officer of the subsidiary of PT Barito Pacific Andry Setiawan said the company is looking for a strategic partner to finance the project. Setiawan said he hopes his company will sign a contract with an engineering, procurement and construction (EPC) company that will help build the factory. It may take 3 to 3.5 years to finish construction of the factory, therefore, it is expected to be operational in the first half of 2011, he said. The new factory will have an annual capacity to produce up to 100,000 tons of butadiene, a derivative of ethylene and a basic material for synthetic rubber and plastic. Chandra Asri is the only producer of ethylene in Indonesia, producing 590,000 tons of the petrochemical material a year. Indonesia's Chandra Asri has shelved indefinitely its plans for an aromatics complex at Anyer in west Java, as aromatics cash margins have been poor for a large part of the year, an industry source said Friday. Chandra Asri was considering investing in an aromatics complex until May this year. The proposed project was tentatively slated for completion in 2011, and centered on a 170,000 mt/year benzene plant. It was to have the capacity to produce 70,000 mt/year of toluene and 55,000 mt/year of mixed xylenes, from pygas. Benzene from the proposed aromatics complex would have been channeled to Styrindo. Singapore investment company Temasek Holdings owns 30% of Chandra Asri, with Indonesian business group Barito Pacific holding a 70% share. A proposed merger of Indonesian petrochemical companies PT Chandra Asri and PT Tri Polyta, previously tipped for completion around mid-2009, has been put on hold, a source from Barito Pacific Tbk., the companies' majority shareholder, said Thursday.